ATLANTA, Georgia, January 30, 2019 (ENS) – The City of Atlanta and the National Football League are proud of the sustainability that will be evident throughout this weekend’s 53rd Super Bowl contest between the New England Patriots and the Los Angeles Rams at Mercedes-Benz Stadium. 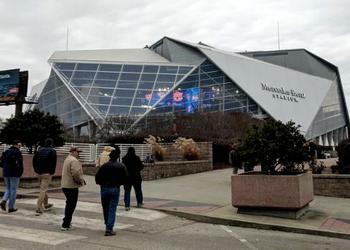 Atlanta officials expect more than 150,000 out-of-town guests for the Super Bowl scheduled for Sunday, February 3. More than one million people are expected to attend several Super Bowl events there and in nearby venues over the next few days. The city is asking people to not drive to the Mercedes-Benz Stadium. Atlanta is already known for its snarled roadways, and the Super Bowl is likely to increase that congestion. 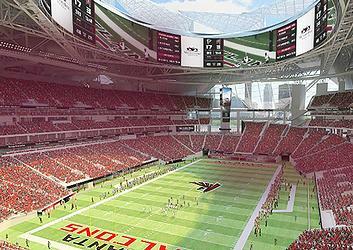 But crowded as it may be this year’s Super Bowl will be sustainable. First of all, Mercedes-Benz Stadium, opened in 2017, is the first sports stadium in the world to achieve a LEED Platinum designation, which means a resource-efficient, high-performing, healthy, cost-effective building. The nearby Georgia World Congress Center is the largest convention center in the world to achieve LEED Gold certification. The Super Bowl Environmental Program is part of the NFL’s sustainability platform. Carried out in partnership with the Atlanta Super Bowl Host Committee, the program aims to reduce the environmental impact of Super Bowl events and leave a positive, “green” legacy. Efforts include food recovery and distribution, recycling and solid waste management, urban forestry projects, material recovery and donation and the use of renewable energy to power events. The stadium is the model of efficiency when it comes to water. Most professional sports stadiums use hundreds of thousands of gallons of water annually, consumed by sports fans, players, staff, and used for irrigation. These numbers increase during special events, such as the Super Bowl. But Mercedes Stadium uses 47 percent less water than comparable-size stadiums. A whole host of measures have been built into the Mercedes Stadium that make water less of a concern. • Restrooms have high-efficiency toilets that use far less water than traditional toilets. • Waterless urinals, manufactured by Waterless Co., Inc. were selected for all the men’s restrooms. Each urinal can save thousands of gallons of water a year. • Mechanical equipment such as boilers, cooling and heating systems were all chosen because they use water more efficiently than comparable systems. • A 680,000-gallon cistern has been installed to collect rainwater, which can be used for cooling the facility or for irrigation. • Xeriscape landscaping was planted; this means vegetation that is naturally grown in the Atlanta area was used for landscaping. In most cases, these are drought-resistant plants that use far less water than plants brought in from other parts of the country. • On-site edible landscaping also was planted. • More than 4,000 solar panels are installed, which will generate around 1.6 million kilowatt hours per year of renewable energy. • Electric car charging stations are available in parking lots. The celebration of the big game was marked with a “green week” of community environmental events that took place in the third week of January. The events focused on tree planting, sharing books, sports equipment and school supplies with local students in need, and giving residents an opportunity to drop off and responsibly recycle e-waste at no charge.